Ted Pretty was known for his enormous smile. On Friday night, family and friends reckon he must have said a beauty at St Peter's gates with the heavens opening up 'with a bang' to welcome a saint home. 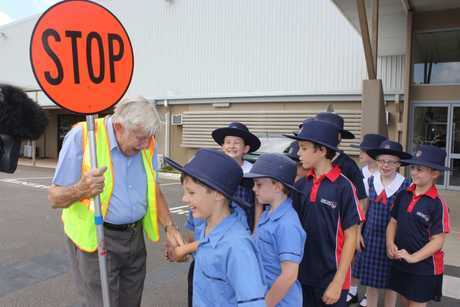 The Sunshine Coast's best-known lollipop man, who volunteered at Suncoast Christian College for 22 years, died at 10.30pm on Friday during the storms, aged 90. "Did Ted hire a band? It was pretty loud!'' was the reaction of one friend, daughter Katie Pretty told the Sunshine Coast Daily. 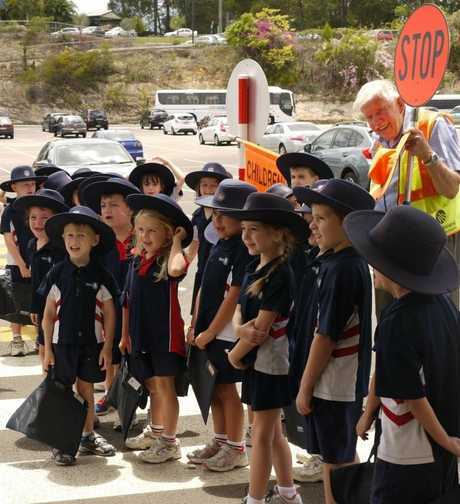 At 84, Mr Pretty stepped down as crossing supervisor at Suncoast after suffering a stroke. He had hoped to 'retire' at 90. Hundreds of students turned out to honour the man who had given them so much joy over the years, including helping teach them to read as part of the college's Support a Reader program. Together with his wife of 66 years, Ted also volunteered for years at Neighbour's Aid where he was known as 'Ted the Toy Man' because he was always giving toys to well behaved children at the store. 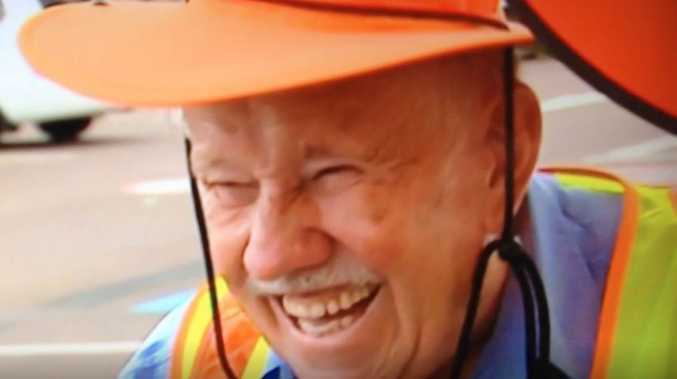 Suncoast Christian College principal Greg Mattiske said Mr Pretty had been an 'icon' at the school, well known for his smiling face, jokes and presence. Mr Pretty's association with the college, dated back to its beginning 40 years ago when he would help set up the student stations in the old pineapple shed after every church service. He was also the official carpark attendant. "He could fit 90 vehicles up there." Years later, he helped children with their reading three days a week for years and would also come in early to help set up the chairs in prep. Ted Pretty shares a laugh with granddaughter Bek. Mr Mattiske said even when Mr Pretty had a very bad fall at the college, scratching his face, he was undeterred. Mr Pretty was well known as one of the most prolific contributors to the Sunshine Coast Daily's joke of the day. 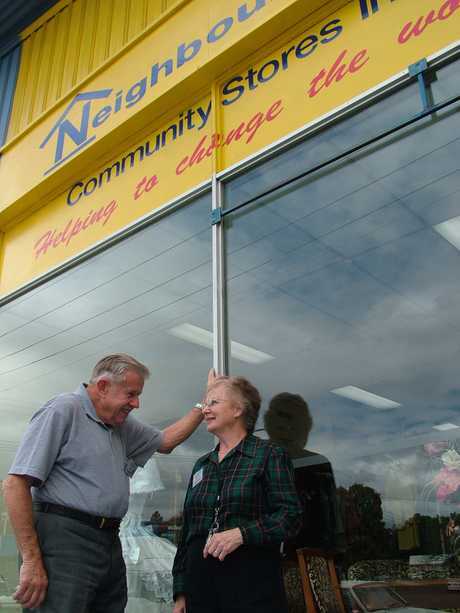 Ted and Marie Pretty outside Neighbours Aid Community Store in Howard Street. What wasn't so well known was that he used to donate the prizes he won, often passes to local tourist attractions, to the college so they could give them to family's needing an outing. Ted Pretty with wife of 66 years, Marie. 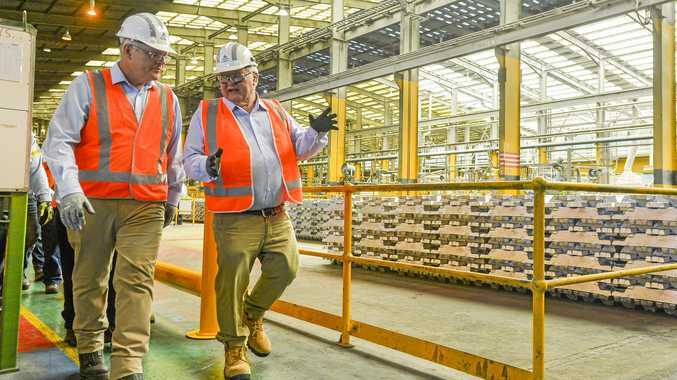 Originally a postman in England, the family first immigrated to Melbourne, where he worked in a factory before they moved to Qld in 1971, buying the corner store in Nambour near the courthouse. Ted and Marie Pretty, and children, looking at a map of Australia in June 1960, before moving out as '10 pound poms'. They then bought a shop in Howard Street, Petty Gifts, while Mr Pretty also worked at a BP service station and then the council. 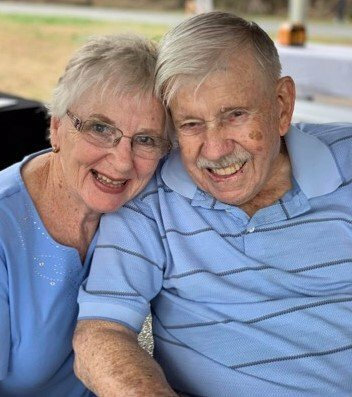 Katie Pretty said there were 'no words' that could fully encapsulate the incredible heart, love and laughter her dad had for his wife, children, grandchildren and great grandchildren. 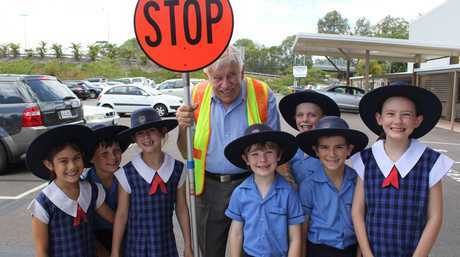 Ted Pretty, who was Suncoast Christian College's lollipop man for more than 22 years, has passed away, aged 90. 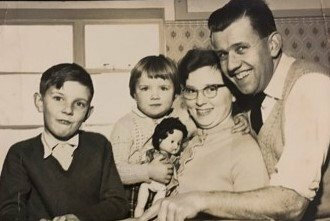 Mr Pretty had three children, Stephen, Donna and Kate, 13 grandchildren, 8 great grandchildren and three great great grandchildren. He would leave love notes for Marie, buy her flowers and go downstairs to shave so as not to disturb her when he got up in the morning. "I have never known anyone to love and adore his wife like dad did,'' Katie said. Mr Pretty's celebration of life service will be held at Suncoast Church on Kiel Mountain Road, Woombye at 9.30am on Tuesday, March 26. His family's advice is those attending is simple: 'Bring your funniest stories''. 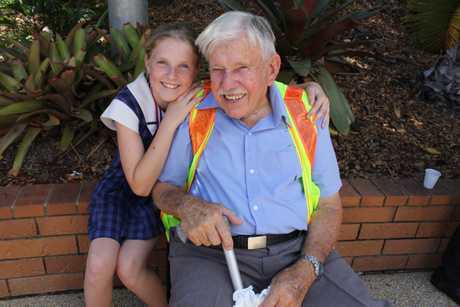 Vale Ted Pretty, "Ted the Toy Man" to many Nambour children. Ted and Marie volunteered with us for many years from our very first store. 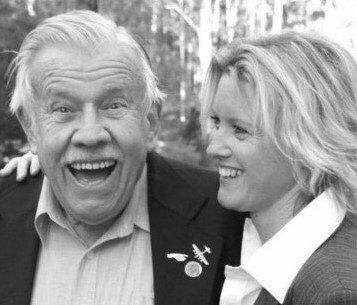 We'll miss his cheeky grin and dad jokes. Rest In Peace Ted. Our prayers are with Marie and the family." We will miss you Ted, your cheeky grin, endless jokes, your testimonies of Gods faithfulness in your life and your generous heart of love. I can imagine the party in heaven right now with so much laughter. Our prayers go out to Marie, Katie all all the family. So saddened to hear that dear Ted has also passed onto glory. What a beautiful man who lived his life to bring joy and encouragement to others. What a lot of laughter he brought to us all. Love to Marie, Katie and all the family and the comfort of God's everlasting arms around you all during this time of loss. Neighbour's Aid wont' be quite the same without Ted's toys spread around for the children to find! What a loss for us all.